Lazarus Leratoeng Mothusi was born and raised in the Mofufutso settlement in the North West Province. He inherited an innate passion for farming from his parents, who were cattle farmers. In 1965 he married his sweetheart, Mamojaki Ruth Mashudute and together they raised nine children two of which have sadly passed away. Apart from Jomo, the other six are all employed in urban areas. Jomo has stood by his father through thick and thin and has made sure the farming enterprise continues to be successful. “He is the one who is always prepared to work long hours to ensure that everything runs smoothly on the farm especially when I have to fulfil my duties as assistant to the chief of the Weltevreden settlement,” he explains. 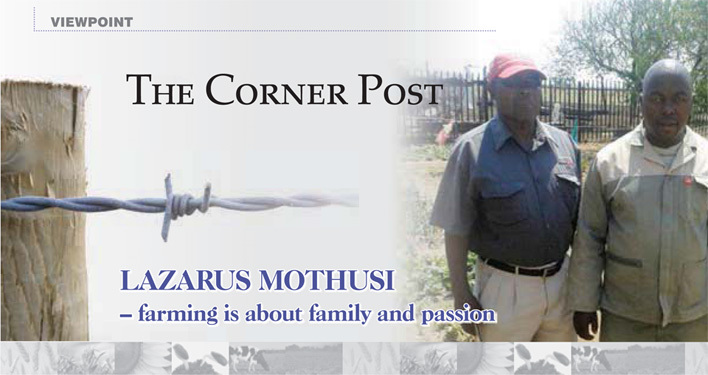 Lazarus started crop farming in 1996 and currently he and his son have approximately 200 hectares of communal ground as well as a further 300 hectares on a farm which they acquired from the Department of Rural Development and Land Affairs to cultivate maize and sunflower and raise their cattle and sheep. Thanks to Grain SA’s input in areas like soil preparation, cultivar choices, fertilisation and weed control, his knowledge of farming has grown tremendously. As every farmer knows, there are many challenges in farming – from financing to the natural circumstances that have to be faced every season. Lazarus explains that Grain SA has even instructed him on how to work with nature and to save and preserve moisture to allow for times when rainfall is lower. One of his proudest moments as a farmer was when he was announced as winner of the Grain SA Developing Grain Producer award in 2006. This award motivated him to work even harder to make a success of his farming enterprise. Lazarus hopes that agriculture in South Africa will grow so that farmers can firstly provide food security to our country and secondly supply food to the rest of the world. To him politics have no place in agriculture and the focus of the country’s leaders should be on making sure a nation is fed. What advice does this successful farmer have for emerging farmers? The opportunities in agriculture are endless. Work hard and make sure you receive sufficient training before you begin. Develop a passion for agriculture. Make it part of who you are. Be sure to first fulfil all your financial obligations before purchasing luxuries.